There is a time to work and a time to play. We do both very well. Want to go for a run on the beach, catch some waves or walk uphill through the argan trees? Taghazout is the place for you. Start your work day with an early surf session in some of the best, world-class surf spots. In cooperation with a well-reputed local surf school in Taghazout, you can choose a surf package which suits your surfing level. Stretch your muscles and meditate under the warm Saharan sun after a long day at the office. Yoga classes are held at the stunning ocean view terrace of Dfrost Surf & Yoga house. The best way to relax and calm your mind. Love jogging? Enjoy 5km of deserted beach right in front of the house. Mix up your normal jogging routine and challenge your body, you might even see a camel or two! Various other activities are also available directly at the beach. You will love it! What else can I do in Taghazout? Enjoy a relaxing steam bath, scrub down and massage at the hammam or visit one of the colourful souks (markets) nearby. A Hammam is a communal bath house where everyone goes once a week for a relaxing steam bath, scrub down or massage. You can choose between the local Hammam and the fancy modern version. A 40-minute trip fromTaghazout will take you to an oasis which might just be heaven on earth. 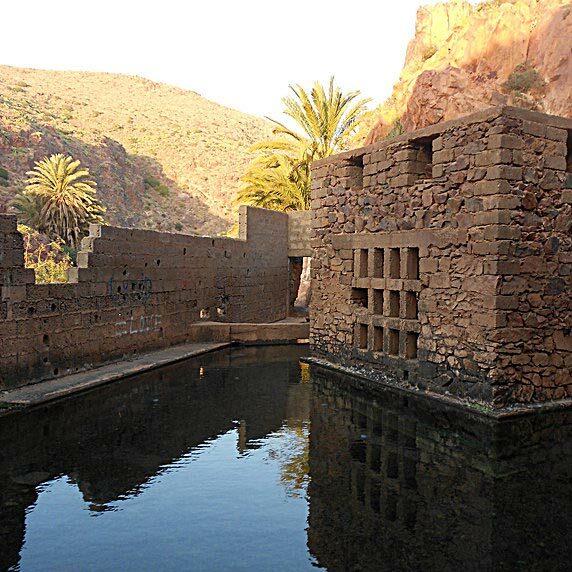 Paradise Valley is an inland, palm-lined gorge carved through the Atlas Mountains. On your walk, you will come across natural rock pools for swimming, and cliffs for the brave ones to jump from into refreshing water. The perfect one day trip. The Souk is a traditional Moroccan market where you find anything you can imagine. Get lost in a sea of bright colours, the incessant calls of hawkers and the smell of mint, herbs and exotic spices. A thoroughly vibrant experience, you’ll come away feeling welcomed and charmed. Remember, bargaining is the price tag in Morocco! You can join us on our weekly shopping trip to the local fruit & veggie souk. Taghazout is an excellent base to explore the rest of scenic Morocco. Take a day trip to Marrakesh, Essaouira or Mirleft. Marrakech, or the Red City, is a bustling city that is full of life and colour. There are so many things to see but getting lost in the labyrinth of the medina is a good place to start. Explore Jemaa el-Fnaa with its storytellers and steaming food stalls, dance in a shisha-scented nightclub and drink endless cups of mint tea – whatever you do, Marrakech won’t dissapoint. Relax by the sea in an eighteenth-century town, enclosed by medieval-looking battlements. Only a 2.5-hour drive from SunDesk, Essaouira has a laidback medina, an artsy vibe, and a picturesque blue and white colour scheme. Perfect for a weekend trip away. Mirleft is a friendly, bustling little place, set back from a series of stunning and tranquil beaches. It’s a great town for those searching for a peaceful, uncommercialized getaway.